Affected node is always targeted first, gives an upgradable damage boost (30% - 60% maybe), can be placed in stealth (possibly several nodes away from nearest access so it isnt useless on high levels, this could also be upgradable) or on nodes adjacent to captured nodes in brute-force. When you place your first kraken, it and all future krakens will set their target to your most recent mark, will also come with a dmg nerf. The current "sacrifice your core or die" meta is kida annoying, to me at least. The current size of 9 doesn't leave much room for creative network design: you don't normally have the space or the max nodes to have more than 3 or 4 nodes of security so almost everything is just a chokepoint then 2 layers of security, sometimes two choke points. Being able to get a few more nodes would make network building much more fun. Being able to lower the number of slots on a net connection might also be interesting. Rebalancing the timer, max nodes, program space, and compile time would be needed. It would make things more interesting if you could specialize your nodes. One example is a guardian with low max shield, but it produces really fast, and higher up the tree it might add regen to the node itself or gain aoe; or if you take the other route it might decrease rate but up the max, and maybe allowing two shields to stack. Another tree could make it give out buffs. One could also produce a balanced node by splitting between trees. 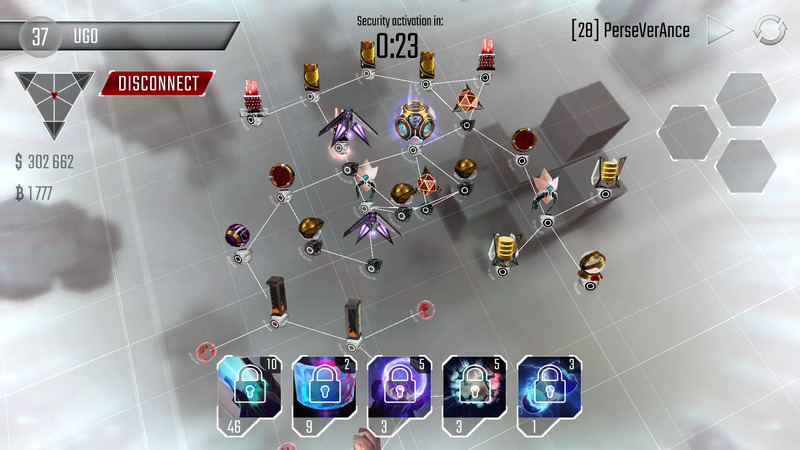 Could also have a tree for nodes used as choke points, a tree with defense stuff like start out black or remain active while upgrading, and a tree with very situational counters, like immune to portal, can't be disabled. Slow install, adds a perminant program slot, can be used in stealth as well for not too much cost. All sound like cool ideas. Though with the kraken rebalance, one could simply mark a location within your resources or even a cluster of defenses, assuming that the kraken will behave the same way at your mark as it is with the core, it's going to make the kraken even more powerful TBH. Also, for node specialisation. It's sounds good but I'd restrict the "unable to disable" perk such that it does not affect the code gate, we need to at least be able to disable code gates or smashing through networks with 3 or more code gates is going to take way too long. I'd like to point out that "mark" sounds like a program that should be available only during stealth. But make it such that the mark programming isn't deleted after the stealth phase is over. * An easy way to start the game again. * new music if you buy a skin. * encourage players to keep money saved - currently high rated players are encouraged to farm/hack intensively then upgrade, so there's nothing to hack. Why not have an "investment" database/b-coin mixer that can't be stolen by beams, but only accessible by data leech (currently a useless program at high levels). But moving bcoins/money into investment earns 30% interest a day. * how about some stealth defences? Ie a node you can't see before attacking, but it becomes visible after a player has started an attack? I think there should be a new defence building that resets the attacker. It should make the programs have to retarget. The building should attack slow since it would be too op for it to completely shut down any attack. leetnoob wrote: * how about some stealth defences? Ie a node you can't see before attacking, but it becomes visible after a player has started an attack? I especially like this idea. We can potentially have "traps" on the node connection lines, so maybe a hidden firewall (shield), or something that spreads antivirus/protection packages to nearby nodes. Having stealth node would just add to the ambiguity. Also as an aside, isn't there a better way than a 26 page thread for ideas? I feel like most of the ideas probably never gets read by most people. I appreciate you sharing your opinion PerseVerAnce. Perhaps the stealth node could be limited to one connection so it can't be used to increase spider web designs. Wait until you get to a higher level than 28- sone players have mad spider webs! Everything is connected to everything with a level 21 sentry.